A new Harris Interactive poll taken 7/6-9/07 finds approval of President Bush at 26%, with disapproval at 73%. 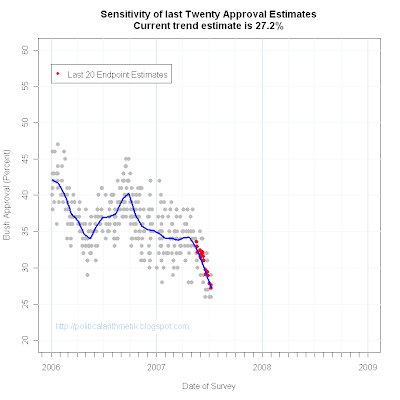 With the addition of this poll, the trend estimate stands at 27.2% approval. 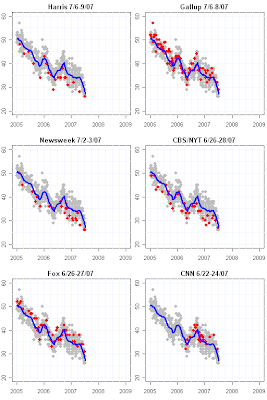 The Harris polls is in line with a recent Newsweek at 26%, CBS at 27% and Gallup at 29%. As can seen from the residual plot below, it is also well within the range of expected variation for polls around the trend estimate. 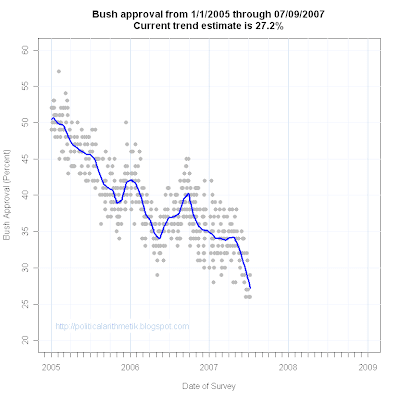 The "But..." in the title of the post is because it appears there is a new AP/Ipsos poll with approval of Bush at 33%. An AP article on economic confidence mentions this approval result, but so far I've not seen an official release of presidential approval from the new AP/Ipsos poll. 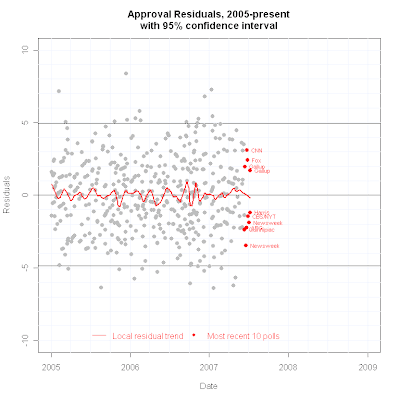 Because the AP/Ipsos approval number is not yet "official" (in my book at least) I will not do a post on it yet. 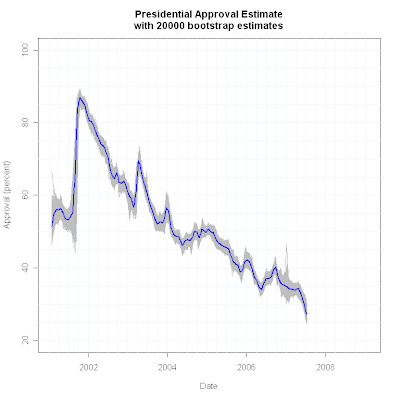 The bottom line is that either way approval continues in the upper 20s, and that certainly remains bad for the administration. With the Harris poll (but NOT AP) there are not concerns in the diagnostics below, and the recent polling continues to follow the trend as we would expect.